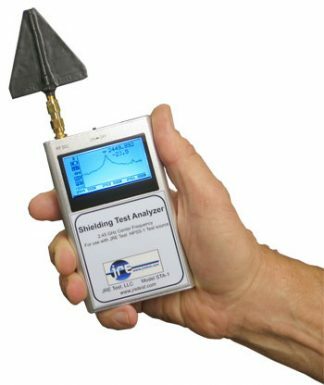 Verify proper shielding isolation of your entire test set up using this handy sensitive spectrum analyzer. Matching the frequency of the JRE HPSS-1 Test Signal Source of 2.45 GHz, operation is simple - just turn it on. 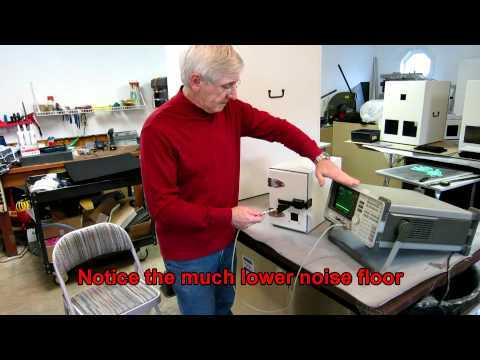 Here's a brief description on how to perform a simple measurement of an RF test enclosure's isolation. We use a small transmitter and measure its signal both inside and outside the enclosure. We know what signal level the transmitter is radiating while it is "in the clear" and again measure the signal level when it is "in the box." The difference between the two measurements is the isolation of the enclosure. A small directional Yagi antenna is used along with a suitable RF spectrum analyzer capable of operation to at least 2.5 GHz. 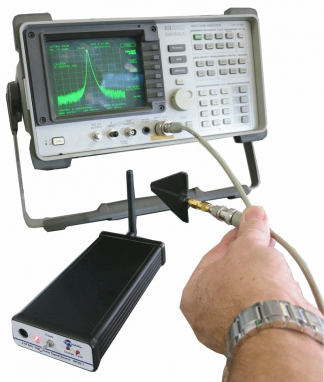 The spectrum analyzer serves simply as a receiver producing a visual display of the transmitter's RF signal and the Yagi antenna a handy probe to "sniff" around the enclosure looking for any signal leaks. The use of the STA-1 as the spectrum analyzer measuring receiver is very cost effective (not tying up a $25-30K analyzer!) and also very easy to hold and 'sniff' with. Let's take a look at how we calibrate this system and how to do the actual test. The transmitter signal source can be any radiating RF source, ideally a somewhat high power source as this will allow the greatest dynamic range in measurement. The JRE HPSS-1 Test Signal Source is a synthesized high power source at 2.45 GHz - matching the STA-1. This frequency is a good match for antenna size, RF power generation and ease of measurement with lower cost spectrum analyzers. Now that we have seen the signal pip on the analyzer with the source on, place the source inside the enclosure and slowly close the door. Notice the signal getting weaker and weaker until it is way down on your spectrum analyzer screen. You are able to see down to -115 dBm, and the enclosure without any I/O cables is spec'd at -95 dB isolation, so the pip you will see will be in that general range -90 to 100 dB. So, right off the get-go, based upon the above, we can see that the enclosure has the proper degree of isolation and this is with the antenna mere centimeters from the enclosure - factor in the 20 dB minimum path loss of 2.45 GHz at a meter distant and you end up with an isolation figure of 100 to 110 dB. This is a fast, easy reliable test of the shielding. It's not a bad idea to perform this test periodically to ensure your enclosure is operating correctly, especially after reconfiguring or shipping. 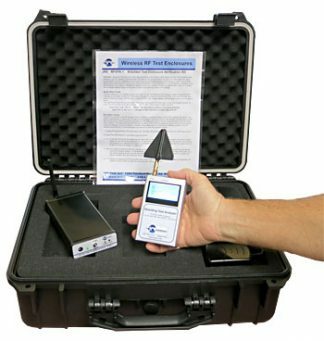 The JRE STA-1 is part of the complete JRE TVK Test Verification Kit.